As Mick sang, you can’t always get what you want, but if you try some times, you just might find you’ll get what you need. 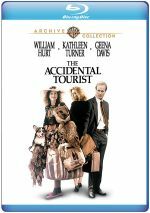 That theme sits at the heart of 1988’s The Accidental Tourist. The film introduces us to Macon Leary (William Hurt), an exceedingly cautious man from an exceedingly cautious family. He writes a series of books called The Accidental Tourist, guides for travelers who hate to leave home and who want matters to be as conservative and innocuous as possible. Macon’s internal repression leads to his estrangement from wife Sarah (Kathleen Turner) after the death of their son Ethan. Macon prefers to bottle up his feelings and withdraw from the world, which eventually leads to Sarah’s departure, as she fears she’ll start to become like him. When he needs to leave town on business for a week, Macon requires a place to board his dog Edward. He drops him off at a new establishment and meets Muriel Pritchett (Geena Davis) there. A divorcee, Muriel instantly displays romantic interest in Macon, but he remains oblivious to the chatty, outgoing and flashy Muriel’s advances. She continues to push things and tries to use his dog’s bad behavior as a route to his heart, but this doesn’t work. 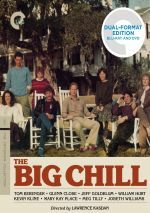 Macon finds a way to disconnect from reality even further when he breaks his leg and goes to stay at the old family home with his sister Rose (Amy Wright) and brothers Charles (Ed Begley Jr.) and Porter (David Ogden Stiers). They’re evem more introverted than he, as we see when we watch their quirky behavior upon the visit of Macon’s publisher Julian (Bill Pullman). When Edward bites Macon, everyone encourages him to ditch the dog, but he won’t because of Edward’s connection to the deceased Ethan. This leads Macon back to Muriel in an effort to tame the wild beast. As she trains the dog, she attempts to infiltrate her way into his heart in her own semi-pushy and eccentric way. Essentially Tourist follows the slow path to romance between this pair, as we see Macon’s many attempts to resist as he reluctantly grows, and we also watch the complications that arise. In a parallel story, we follow the unlikely romance between Julian and Rose, as his swinging single publisher goes in the opposite direction of Macon to seek out greater stability. As I alluded at the start of my review, that offers the main subtext of Tourist: situations that may outwardly sound all wrong to us sometimes end up being exactly what we need. Macon presents an extreme case of someone who resists change, but that helps illustrate the theme even more clearly: if a stick-in-the-mud like Macon can learn from an improbable situation, so can the rest of us. Writer/director Lawrence Kasdan creates a deft mix of comedy and drama with Tourist. The film opens in a somber manner but then switches to the quietly absurd via the depictions of Muriel as well as Macon’s family. Tourist always shows these characters and situations in an understated manner and allows the humor to emerge in a gentle way. This allows those moments to succeed and keeps them from seeming mean-spirited. In addition, this helps the comedy to blend into the drama well. When Muriel goes from a wacky personality to one we take more seriously, the tender sense of humor previously displayed lets us buy into this. That comes across best in arguably the film’s most moving moment. After he accepts an invitation to dinner, Macon tries to drop off a note to decline. Muriel catches him and Macon tells her his personal reasons for not wanting to get close to anyone. In response, she simply leads him upstairs and comforts him. The scene deftly creates a change in character without fireworks or anything showy, as it opens up matters in a natural and emotional manner. Davis earned an Oscar for her portrayal of Muriel, and it seems deserved. The character easily could have been a goofy cartoon, but Davis enables Muriel to rise above her one-dimensional moments. It’s a fine performance that adds depth to the film. Hurt made a career out of this sort of role, but he also brings uncommon strength to another part that could lack much depth. Macon doesn’t seem like much of a stretch for Hurt, but he still contributes that WASP chilliness necessary along with the ability to grow. Macon develops in a natural way that seems believable and never violates the barriers of the character. Tourist doesn’t feature any easy answers, so it’s not like Macon and Muriel hook up and he’s “fixed”. The film explores its issues with depth and gives us a nice examination of the concerns. Humorous and unsentimental enough for men but romantic enough for women, The Accidental Tourist presents a subdued and powerful piece. The Accidental Tourist appears in an aspect ratio of approximately 2.35:1 on this Blu-ray Disc. Though it suffered from some of the flaws connected to its era, the transfer held up well. Sharpness usually appeared positive. Some interiors could seem a smidgen soft, but those remained minor distractions. Otherwise, the image stayed distinctive and well defined. No issues with jagged edges or moiré effects appeared, and I witnessed no edge haloes. Print flaws also remained absent in this clean presentation. A quiet, subdued movie, Tourist presented a quiet, subdued palette. Most of the movie demonstrated restricted tones, with the majority of the more vivid hues related to Muriel’s house and wardrobe. The disc handled the colors well. Blacks were acceptably deep and firm, and shadow detail looked pretty concise. As noted, low-light shots could be a little fuzzy, but they usually appeared smooth. This turned into a pleasing presentation. The DTS-HD MA 2.0 soundtrack of The Accidental Tourist seemed unremarkable but suitable for the project. No one would expect an aggressive mix for this sort of quiet drama, and the audio fit the material. The soundfield betrayed a heavy emphasis on the forward channels, and those presented good stereo imaging for the music and a decent sense of environment for effects. The latter elements created a nice feeling of place in their gentle way, and meshed together pretty well. The rear channels didn’t bring much to the package. They added some reinforcement at times and occasionally portrayed some unique material, such as a plane that went from one area to another, but the back speakers remained pretty inconsequential much of the time. However, that seemed fine with me, as the flick didn’t require anything more than that. Audio quality appeared solid. Dialogue was natural and distinctive, as I noticed no signs of edginess or problems with intelligibility. Music was rich and fairly lush, as the instrumentation seemed clear and well defined. Effects stayed minor but accurate, so they came across as clean and appropriately detailed. Nothing special occurred here, but the track supported the film acceptably well. How did the Blu-ray compare to the DVD from 2004? Audio remained similar – the lossless DTS-HD MA track offered a little more breadth but couldn’t do much with the restrictions of the source. Visuals demonstrated more obvious improvements, though. The Blu-ray seemed notably better defined and cleaner, as it lost the print flaws from the DVD. This turned into an obvious step up in quality. The Blu-ray duplicates the DVD’s extras, and we open with an introduction from writer/director/producer Lawrence Kasdan. In this three-minute, 15-second piece, he chats about themes and his intentions, and Kasdan also gets into a few aspects related to the making of the flick and reactions to it. Kasdan presents a decent little examination of the movie, but he doesn’t offer much depth due to the brevity of the program. Next comes It’s Like Life, a 13-minute, three-second featurette about Tourist. This piece presents movie clips and comments from Kasdan plus actors Geena Davis and Kathleen Turner. Some of Kasdan’s statements come from 2003, but most of the information stems from 1988. We hear a few notes about characters, themes, and working methods, but the majority of the program simply shows shots from the flick and reiterates the story. It’s a surprisingly dull retrospective that presents little of use. Additional information comes from a scene-specific audio commentary with actor Geena Davis. She chats for 38 minutes, 18 seconds of the movie and covers a mix of topics. Davis gets into her desire to play Muriel and how she obtained the part, her take on the role, working on location and with Hurt, and her reactions to the Oscar experience. Davis provides a lot of bang for the buck, as her short discussion includes lots of great material. The format makes it an easy listen: the commentary automatically skips from one scene to the next, so we don’t get stuck with dead air. Davis’s chat definitely merits a listen. In addition to the flick’s theatrical trailer, we get a whopping 18 lifted scenes. A substantial collection, these fill 37 minutes, 32 seconds. Many of them present totally deleted segments, whereas others portray elements they later re-shot. It’s a generally interesting set, and we even find a few bits that probably should have made the final film. For example, one appears that makes Muriel look like a stronger character, though not in an inappropriate way; it actually rectifies one problem I had with her depiction. Subdued and introspective, The Accidental Tourist presents an engaging drama with a gentle comedic side. Bolstered by a strong cast and a winning tone, the movie fares well. The Blu-ray provided very good picture as well as adequate audio and a decent smattering of bonus features. Tourist becomes an involving character piece.